Fright Nights, the UK’s leading ghost hunting specialist, will be holding paranormal investigations from 9pm – 5am at Warwick Castle once a month from February 2009. The public will be allowed to spend the night at the Castle, reputed to be one of Britain’s most haunted Castles, visiting the legendary “Ghost Tower” and using the latest ghost hunting and psychic equipment to detect ghosts. With over 400 years of reported paranormal activity, it is of no surprise that many visitors have witnessed ghostly apparitions. The earliest reported ghost relates to Moll Bloxham, an infamous witch who cursed the castle with the ghost of a dog. Local vicars tried to exorcise it, however it is alleged that even after 400 years, the dog still wanders the ramparts. Over the years many visitors have heard mysterious footsteps pacing the corridors of the Castle. During World War I, the footsteps were witnessed literally walking through an American gentleman. The ghost of Sir Fulke Greville, a poet and statesman, who made Warwick Castle into a luxurious palace, still haunts the tower were he resided. Stabbed to death by his manservant during an argument over money, Sir Fulke Greville’s ghost appears from the portrait hanging over the fire place in the study. He has been seen walking about the rooms in the ‘Ghost Tower’, loathe to leave his beloved castle. 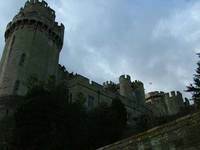 Martin Jeffrey, Director of Fright Nights said “Fright Nights is delighted to be returning to Warwick Castle, a castle rife with paranormal activity. Next year, we’ve been granted even more access to the Castle's most haunted areas including the infamous Guy's Tower. Anyone attending our ghost hunts should be pre-warned that anything could happen inside this haunted and foreboding building”. Tickets, which cost £75, can be purchased online at Frightnights.co.uk.